In 1940, the Arctic experienced temperatures 3°C warmer than today. Arctic sea ice shrank to a record low in 2012, and second place was in 2007. Full temperature data sets from the Arctic reveal it is warmer today than in 1940. The claim that the Arctic was warmer at earlier points in the 20th century is based on cherry-picked temperature data from a few stations. In fact, the Arctic summers of 2005, 2007, 2010, and 2011 were warmer than any time in at least the last 600 years. 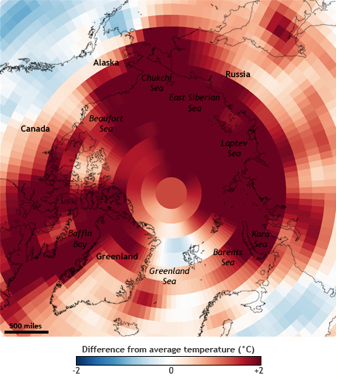 From October 2010 to September 2011, surface temperatures in the Arctic were 1.5 degrees Celsius warmer than average. Figure 1 shows where average air temperatures were up to 2 degrees Celsius above (red) or below (blue) the long-term average (1981-2010). Figure 1: Departure of October 2010-September 2011 surface temperatures in the Arctic from the long-term average (1981-2010). Source: NOAA. The Arctic’s 1.5-degree surface temperature anomaly was larger than the global average anomaly. This difference confirms what global climate models were projecting as far back as 30 years ago: that the Arctic region would warm faster than the rest of the planet due to long-term climate change. The past 6 years in the northern polar region (above 60°N in the Northern Hemisphere) have been the warmest in the historical record. The city of Barrow, located in the northernmost region of Alaska, had a record summer run of 86 consecutive days with minimum temperatures at or above freezing, beginning on June 30. The previous record was 68 days set in 2009. The warmth is transforming the Arctic. There is less sea ice in the summer, and it is thinner than it used to be, decreasing habitat for polar bears and other marine mammals. Meanwhile, plant productivity — both on land and in the ocean — is increasing. Glaciers and ice sheets are rapidly losing mass, and the melting is freshening the Arctic Ocean. 1934 was the hottest year on record in the U.S.